What is TOPIK and should You Take the the Test? Interested in learning the Korean language? Or looking for a job in Korea? The TOPIK test might be helpful for you. Here’s more information to help decide if it is. What is the TOPIK test? The TOPIK test is the Test of Proficiency in Korean or한국어능력시험. It is divided into 2 levels – TOPIK 1 and TOPIK 2. Confusingly, both TOPIK 1 and 2 are then further divided into sublevels (2 for TOPIK 1 and a further 3 sublevels for TOPIK 2). When registering for the test, you must choose to take either TOPIK 1 or TOPIK 2. Your final score will then correspond to one of the sublevels, and be your final TOPIK grade. Because it focuses only on listening, reading, and writing, it is helpful if you’re applying for a job. In professional situations or to study in core programs (not as an exchange student) at Korean universities, it is needed. Some universities also have an entry requirement that a TOPIK score is needed as a necessary part of the application process. If your goals in Korea are different however, for example teaching English or working in a company you’re already connected to, it might not be necessary. But I want to Focus on Conversation/Speaking Korean? Then the test might not be for you. Other types of classes that focus on speaking ability might be a better fit. If you do decide to take the TOPIK, make sure you set aside some time to also focus on speaking ability, so that you can develop that skill as well and it doesn’t get left behind. Hagwons and language programs can help here. The test is not offered very often, only 5-6 times per year. This means if you need to submit your test score before a certain date, you may have to take the test several months in advance, to make sure the results are published in time. Plan ahead so that you don’t miss it. 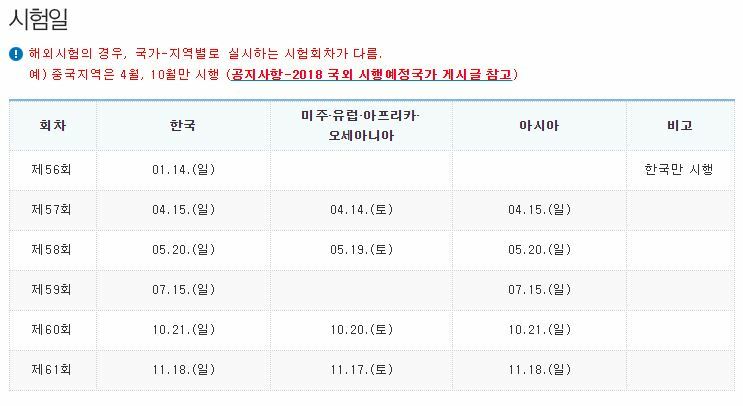 Though the schedule has not yet been released for 2019, here it is for 2018. There were 5 worldwide dates, and 6 in Korea. Out of the three components of the TOPIK, the writing section is considered the most difficult. To get a high score in the test overall however, it’s necessary to also do well in that section. When studying for it, make sure to spend most of your time developing your writing ability. Extra classes through hagwons can also help with this. It is also important to increase your vocabulary significantly. Study guides with 2500 TOPIK words are popular. Some of the terms might not even be used in modern daily conversation, but they’re necessary for comprehension during the exam. The exam is two and a half hours long, and is held in designated centers around the country. Though you can take TOPIK outside of Korea, it is often only offered once per year in each major city – for example in 2018, it was once in Toronto, and once in Vancouver, for Canada. Again, spots fill up early, so make sure to plan by when you will need your score. In Korea, it costs 40,000krw to take it each time. To achieve level 1, only basic commands, sentence structures, and every day vocabulary are needed. When applying for a job, having a TOPIK score on your resume, even if it is relatively low, can still be helpful. The levels progress gradually, and by the time you have reached level 6, full academic and professional fluency is expected. TOPIK scores are valid for two years, and then must be taken again to officially count. However, once level 6 is attained, it is often not renewed again. Especially if you’re looking for a job in Korea, having a TOPIK score can be a big boost to your resume. With it offered in countries around the world, take the chance to try it!